Asemic writing is a wordless open semantic form of writing. The word asemic means "having no specific semantic content", or "without the smallest unit of meaning". With the non-specificity of asemic writing there comes a vacuum of meaning, which is left for the reader to fill in and interpret. All of this is similar to the way one would deduce meaning from an abstract work of art. Where asemic writing differs from abstract art is in the asemic author's use of gestural constraint, and the retention of physical characteristics of writing such as lines and symbols. Asemic writing is a hybrid art form that fuses text and image into a unity, and then sets it free to arbitrary subjective interpretations. It may be compared to free writing or writing for its own sake, instead of writing to produce verbal context. The open nature of asemic works allows for meaning to occur across linguistic understanding; an asemic text may be "read" in a similar fashion regardless of the reader's natural language. Multiple meanings for the same symbolism are another possibility for an asemic work, that is, asemic writing can be polysemantic or have zero meaning, infinite meanings, or its meaning can evolve over time. Asemic works leave for the reader to decide how to translate and explore an asemic text; in this sense, the reader becomes co-creator of the asemic work. In 1997 visual poets Tim Gaze and Jim Leftwich first applied the word asemic to name their quasi-calligraphic writing gestures. They then began to distribute them to poetry magazines both online and in print. The authors explored sub-verbal and sub-letteral forms of writing, and textual asemia as a creative option and as an intentional practice. Since the late 1990s, asemic writing has blossomed into a worldwide literary/art movement. It has especially grown in the early part of the 21st century, though there is an acknowledgement of a long and complex history, which precedes the activities of the current asemic movement, especially with regards to abstract calligraphy, wordless writing, and verbal writing damaged beyond the point of legibility. Jim Leftwich has recently stated that an asemic condition of an asemic work is an impossible goal, and that it is not possible to create an art/literary work entirely without meaning. He has begun to use the term "pansemic" to describe this type of work. Others such as author Travis Jeppesen have found the term asemic to be problematic because "it seems to infer writing with no meaning." Asemic writing exists in many different forms. It is often created with a pen or brush, but can range from being hand drawn in the sand with a stick and documented by photography, or to works on canvas, paper, computer images, and animations. The key to asemic writing is that even though it is traditionally "unreadable" it still maintains a strong attractive appeal to the reader's eye. Various asemic writing includes pictograms, or ideograms the meanings of which are sometimes suggested by their shapes, though it may also flow as an abstract expressionist scribble which resembles writing but avoids words. Asemic writing, at times, exists as a conception or shadow of conventional writing practices. Reflecting writing, but not completely existing as a traditional writing system, asemic writing seeks to make the reader hover in a state between reading and looking. 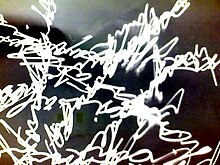 Asemic writing has no verbal sense, though it may have clear textual sense. Through its formatting and structure, asemic writing may suggest a type of document and, thereby, suggest a meaning. The form of art is still writing, often calligraphic in form, and either depends on a reader's sense and knowledge of writing systems for it to make sense, or can be understood through aesthetic intuition. True asemic writing occurs when the creator of the asemic piece cannot read their own asemic writing. Relative asemic writing is a natural writing system that can be read by some people but not by everyone (e.g. ciphers, wildstyle, etc.). Most asemic writing lies between these two extremes. Influences on asemic writing are illegible, invented, or primal scripts (cave paintings, doodles, children's drawings, etc.). But instead of being thought of as mimicry of preliterate expression, asemic writing may be considered to be a global postliterate style of writing that uses all forms of creativity for inspiration. Other influences on asemic writing are alien languages in science fiction, artistic languages, sigils (magick), undeciphered scripts, and graffiti. Uses for asemic writing include mental and creative idea stimulation, non-verbal communication, hoaxes, and general authorial self-expression. Asemic writing occurs in avant-garde literature and art with strong roots in the earliest forms of writing. The history of today's asemic movement stems from two Chinese calligraphers: "crazy" Zhang Xu, a Tang Dynasty (circa 800 CE) calligrapher who was famous for creating wild illegible calligraphy, and the younger "drunk" monk Huaisu who also excelled at illegible cursive calligraphy. Japanese calligraphers subsequently expanded upon Chinese abstract calligraphic expression by Hitsuzendō (the way of Zen through brush), allowing their works to move past formal presentation and "breathe with the vitality of eternal experience". In the 1920s Man Ray, who was influenced by Dada, created an early work of wordless writing with his poem Paris, Mai 1924, which is nothing more than dashes on a page. Later in the 1920s, Henri Michaux, who was influenced by Asian calligraphy, Surrealism, and Automatic writing, began to create wordless works such as Alphabet (1925) and Narration (1927). Michaux referred to his calligraphic works as "interior Gestures". The writer and artist Wassily Kandinsky was an early precursor to asemic writing, with his linear piece Indian Story (1931) exemplifying complete textual abstraction. In the 1950s there is Brion Gysin (whose calligraphy was influenced by Japanese and Arabic calligraphy), Isidore Isou (who founded Lettrisme), Cy Twombly (a former US Army Cryptologist), and Morita Shiryū/Bokujin-kai Group (Ink Human Society) all of whom expanded writing into illegible, abstract, and wordless visual mark-making; they would help lay the foundation for asemic writers of the future. Mira Schendel was an artist from Brazil who created many illegible works over the course of her life, for example her piece Archaic Writing (1964). Mirtha Dermisache is another writer who had created asemic writing since the 1960s. Dermisache actively said that even though her graphisms have no meaning, they still retained the full rights of an autonomous work. 1971 was the year when Alain Satié released his work Écrit en prose ou L'Œuvre hypergraphique which contains asemic writing throughout the entire graphic novel. León Ferrari was another artist/poet who created many asemic works in the 1960s and 70s, such as Escritura (1976). 1974 saw the release of Max Ernst's work Maximiliana: The Illegal Practice Of Astronomy: hommage à Dorothea Tanning; this book is a major influence on asemic writers such as Tim Gaze, Michael Jacobson, and Derek Beaulieu. Roland Barthes was also involved with asemic writing; he titled his asemic works Contre-écritures. A modern example of asemic writing is Luigi Serafini's Codex Seraphinianus (1981). Serafini described the script of the Codex as asemic in a talk at the Oxford University Society of Bibliophiles held on May 8, 2009. In the 1980s, Chinese artist Xu Bing created Tiānshū, or A Book from the Sky which is a work of books and hanging scrolls on which were printed 4000 hand carved meaningless characters. The 1980s also saw artist Gu Wenda begin the first of a series of projects centered on the invention of meaningless, false Chinese ideograms, depicted as if they were truly old and traditional. One exhibition of this type was held in Xi'an in 1986, featuring paintings of fake ideograms on a massive scale. Also in China, during the 1990s, an abstract calligraphy movement known as "Calligraphy-ism" came into existence, a leading proponent of this movement being Luo Qi. Calligraphy-ism is an aesthetic movement that aims to develop calligraphy into an abstract art. The characters do not need to retain their traditional forms or be legible as words. In Vietnam during the 2000s, a calligraphy group called the Zenei Gang of Five appeared. To this group of young artists, “Wordless” means that which cannot be said, that which is both before and beyond the specificity of naming. To be without words is saying nothing and saying everything. 2013 saw the release of An Anthology of Asemic Handwriting (Uitgeverij), which has over a hundred artists represented from many corners of the world. Asemic writing has also received mention and space in The Last Vispo Anthology: Visual Poetry 1998-2008 (Fantagraphics, 2012). In 2011 a full issue of William Allegrezza's poetry journal Moria was focused on the participants and theory of asemic writing. Also in 2011, John Moore Williams published an asemic issue of his journal The Bleed. Other publications that cover asemic writing include Tim Gaze's Asemic Magazine, Michael Jacobson's curated weblog gallery The New Post-Literate: A Gallery Of Asemic Writing, Marco Giovenale's collective group blog Asemic Net, and De Villo Sloan's collaboration project Asemic Front. Book publishers of asemic writing include Tim Gaze's Asemic Editions, Michael Jacobson's Post-Asemic Press, and Rosaire Appel's Press Rappel. Asemic writing has appeared in books, artworks, films and on television but it has especially been distributed via the internet (such as on Facebook, Tumblr, Pinterest, YouTube, Scribd, IUOMA, and Reddit). Group exhibits of asemic writing have occurred in bricks and mortar art galleries in Australia, Russia, Malta, Mexico, Spain, Italy, and the United States. More recently there have been architecture models which utilize asemic writing in the design process. Currently, there is a robot that performs asemic writing live, and there is asemic writing produced by artificial intelligence. As a creator of asemics, I consider myself an explorer and a global storyteller. Asemic art, after all, represents a kind of language that's universal and lodged deep within our unconscious minds. Regardless of language identity, each human's initial attempts to create written language look very similar and, often, quite asemic. In this way, asemic art can serve as a sort of common language—albeit an abstract, post-literate one—that we can use to understand one another regardless of background or nationality. For all its limping-functionality, semantic language all too often divides and asymmetrically empowers while asemic texts can't help but put people of all literacy-levels and identities on equal footing. What is “beyond asemic writing”? Maybe a neural brain-scan of an author *thinking about* asemic writing. Maybe *generative asemic writing*. Maybe “asemic biomimicry”. Maybe nanoasemic writing inscribed with atomic force microscopes by Artificial Intelligences. False writing systems are artificially constructed alphabets or scripts used (sometimes within the context of a false document) to convey a degree of verisimilitude. Examples of this include alien dialogue in comic strips, animated cartoons, and graphic novels (such as Alan Moore's The League of Extraordinary Gentlemen, and the Valérian and Laureline series). The script in Luigi Serafini's 1981 Codex Seraphinianus was confirmed by the author to have no occult meaning. The Voynich manuscript, a mysterious work on which the Codex Seraphinianus was likely based, uses an undeciphered writing system that some speculated to be false. Glossolalia or speaking in tongues. John M. Bennett, calligraphy works. Marian Bijlenga, Written Weed (2004), is a book of twigs and seeds laid out like text. Timothy Ely; "Ely's work evokes a range of thematic material: arcane knowledge, secrets and cryptography, time and timelessness. He has developed a private written language using 366 individual signs or "idiographic cyphers" which he refers to as "cribriform." Ungno Lee or Yi Eungro, letter abstracts. Lettrisme, the letteristes often invented new symbols for their artworks and writing, and synthesized writing and other modalities under the term hypergraphy. Glenn Ligon and his text-based paintings in which a phrase chosen from literature or other sources is repeated continuously, eventually dissipating into murk. Steve McCaffery, against writing (1972-1985). José Parlá, abstract calligraphic graffiti. Prince (musician), name change to an unpronounceable symbol. The Rohonc Codex is an illustrated manuscript book by an unknown author, with a text in an unknown language and writing system. Mary Ellen Solt, Moonshot Sonnet (1964). Asemic writing by Emily Dickinson from 1859. Calligraph and Seismograph by Federico Federici. Asemic Post-Graffiti from Nuno de Matos. ^ Michael Jacobson. "Works & Interviews". ^ "Tim Gaze. Asemic Magazine". Asemic Magazine. ^ "Full Of Crow Tim Gaze interview". ^ From Greek: asemos (αόεμoβ) = without sign, unmarked, obscure, or ignoble. ^ "Satu Kaikkonen interview". SCRIPTjr.nl. ^ "Samplekannon interview with Michael Jacobson". Samplekannon. ^ "Galatea Resurrects: The Nearness Of Asemic Writing by Jim Leftwich". ^ "Jim Leftwich: "asemic writing definitions and contexts, 1998-2016"". ^ "Hans Ulrich Obrist in Conversation About Inventing New Languages". Sleek Magazine. ^ Thelma Mort. "Cape Town artist Andrew van der Merwe carves out beach calligraphy niche". BusinessDay. ^ Jaime Morrison. "Nonism: Asemic Art". ^ Geof Huth. "Varieties of Visual Poetry". dbqp. ^ "PRATE, Michael Jacobson interview". Fullofcrow.com. Retrieved 10 November 2014. ^ "Michael Jacobson interview". SCRIPTjr.nl. Retrieved 10 November 2014. ^ dermisache-9 Newsletters & 1 Reportaje 2000: Newsletter, 2000 from Mirtha Dermisache, Nueve Newsletters & Un Reportaje, Buenos Aires : El borde, Marseille : Mobil-Home, Montpellier : Manglar, 2004. Offset printing, 440 copies. ^ Sarah Nicholls. "Center for Book Arts: Making Sense of Asemic Writing". Centerforbookarts.blogspot.com. Retrieved 10 November 2014. ^ "'Leaking the Squalls': The Art and Letters of Henri Michaux". natalie ferris. Retrieved 10 November 2014. ^ "Calligraphy The Bokujin-Kai Group and Shiryu Morita". infinity of utterances kathryn simon phd. ^ "Witness Mirtha Dermisache". Jacket2.org. Retrieved 10 November 2014. ^ Alain Satie, Écrit en Prose, Éditions PSI, 1971. ^ Buzz Poole. "The Writing of Art, The Art of Writing". Printmag.com. ^ "PRATE". Fullofcrow.com. Retrieved 10 November 2014. ^ Tierra Innovation. "Vispo". Theparisreview.org. Retrieved 10 November 2014. ^ "Drawings on Writing". Drawingsonwriting.org. Retrieved 10 November 2014. ^ Jeff Stanley (2010). "To Read Images Not Words: Computer-Aided Analysis of the Handwriting in the Codex Seraphinianus (MSc dissertation)" (PDF). North Carolina State University at Raleigh. pp. 8–9. Retrieved 9 April 2012. ^ "Free writing". stalker. Retrieved 10 November 2014. ^ "asemic writing - Donna Tull". Lacon4.wordpress.com. Retrieved 10 November 2014. ^ "An Anthology Of Asemic Handwriting". ^ "The Last Vispo Anthology". Crag Hill & Nico Vassilakis (editors). ^ "moria". Moriapoetry.com. Retrieved 10 November 2014. ^ "The New Post-Literate: A Gallery Of Asemic Writing". ^ "Press Rappel, Printed Matter". ^ "Bright Stupid Confetti: Asemic Writing: An International Perspective curated by Michael Jacobson". ^ "Spring 2018 Women Asemic Writers Exhibit". ^ "Facebook Asemic writing: The New Post-Literate group". ^ "Asemic writing on Pinterest". ^ "Asemic Writing For Mail Artists at IUOMA (The International Union Of Mail Artists)". ^ "Asemic writing at The Hahndorf Academy". ^ "The First Asemic Writing Exhibit In Russia". ^ "Asemic Show at the Spiral, Malta". ^ "First Asemic Writing Exhibit In Mexico". ^ "Utsanga Asemic Writing Exhibit". ^ "Asemic Writing: Offline & In The Gallery". ^ "Asemic Scapes by Sarah Schneider". Dezeen. Retrieved 10 November 2014. ^ "suckerPUNCH » Asemic ForestsuckerPUNCH". SUCKERPUNCHDAILY.COM. Retrieved 10 November 2014. ^ "The Post-Literate (R)Evolution". Post-literate.tumblr.com. Retrieved 10 November 2014. ^ "SCRIPTjr.nl". SCRIPTjr.nl. Retrieved 10 November 2014. ^ Sterling, Bruce (July 13, 2009). "Web Semantics: Asemic writing". Wired.com. Retrieved February 29, 2016. ^ "The Commonline Journal: Without Words: An Interview with Tim Gaze". Commonlinejournal.com. Retrieved 10 November 2014. ^ "Gammm: le scritture asemantiche di irma blank / gillo dorfles. 1974". Marco Giovenale with English translation by Nerida Newbigin, 2014. ^ Ian Boyden. "OF SCRIPTS AND STARS: The Cipheric Aesthetics of Timothy C. Ely's Cribriform Script". ^ Adam de Paor-Evans. "Mumble Rap: cultural laziness or a true reflection of contemporary times?". The Conversation. ^ "Poem Brut". Steven J. Fowler. ^ Jaap Blonk & Tomomi Adachi. "Asemic Dialogues". ^ "asemic-writing-matox". Post Graffiti :: Urban Skins. Retrieved 10 November 2014.